The Ionic Pro® ionic air purifier traps irritants and allergens on three collection blades and then releases purified air back into the room. 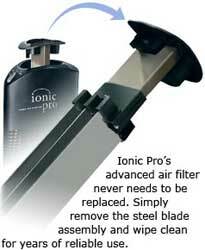 Safe and easy to use, Ionic Pro® will give your family the clean air they need to stay healthy. 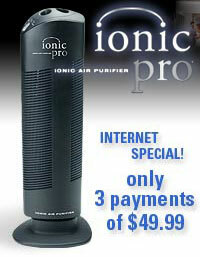 The Ionic Pro® ionic air purifier circulates air without the use of loud and disruptive motors or fans, and has no costly filters to replace. Simply remove the steel blade assembly and wipe clean with a damp cloth.